This hotel is located in a 19th-century building in Dublin’s Temple Bar district. Guests can explore Dublin Castle and Trinity College, both are just a 5-minute walk away. 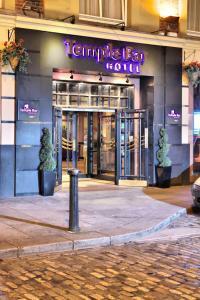 Rooms at The Dublin Citi Hotel of Temple Bar have a warm or fresh décor. They feature a TV, ironing equipment and tea/coffee-making facilities. Dublin Citi Hotel has a partnership with Crunch Fitness in Temple Bar, which allows guests to enjoy complimentary access to the premises during their stay. 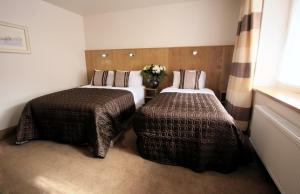 Kellys Hotel price per day from €84 Situated in the centre of Dublin's cultural quarter, this small hotel offers boutique rooms and free Wi-Fi. Each room at the adult-only Kelly's Hotel has a flat-screen LCD TV with DVD player and a custom-made mattress. In the mornings, guests can enjoy continental breakfast in the award-winning French restaurant, L'Gueuleton. The airport shuttle coach is not far from the hotel. The Drury Street Car Park is nearby for overnight car parking. Restaurant F.X.Buckley. 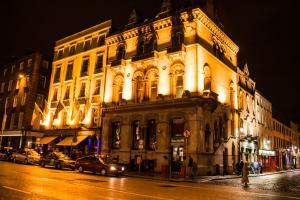 Steakhouse Crow Street Temple Bar, Dublin Guest reviews: 9,2/10 ~ 0,1 km from Dublin Citi Hotel of Temple Bar Address: Crow street, Dublin 2, Dublin. Cuisine: Seafood. Restaurant IL VICOLETTO, Dublin Guest reviews: 9,2/10 ~ 0,1 km from Dublin Citi Hotel of Temple Bar Address: 5 Crow Street, Temple Bar, Dublin 2, Dublin. Cuisine: Italian. Restaurant Kathmandu Kitchen Nepalese & Indian , Dublin Guest reviews: 9,2/10 ~ 0,1 km from Dublin Citi Hotel of Temple Bar Address: 18 Dame Street, Dublin 1, Dublin. Cuisine: Indian. Restaurant The Old Storehouse, Dublin Guest reviews: 9,2/10 ~ 0,1 km from Dublin Citi Hotel of Temple Bar Address: Crown Alley, Dublin. Cuisine: Irish. Restaurant O'Flaherty's At The Old Storehouse, Dublin Guest reviews: 9,2/10 ~ 0,1 km from Dublin Citi Hotel of Temple Bar Address: The Old Storehouse, D2, Dublin. Cuisine: Irish.